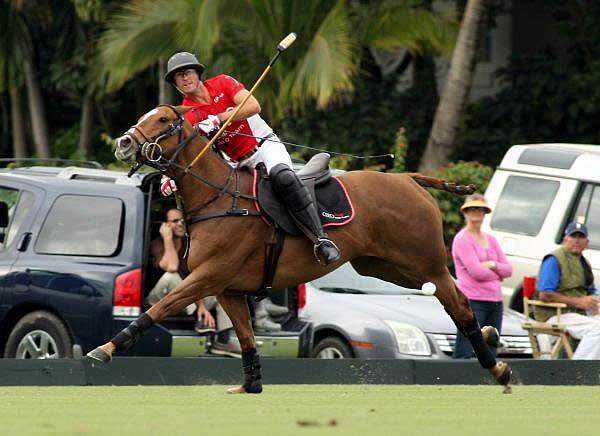 WELLINGTON, FL – January 19, 2013 – Trailing by five goals early in the fourth chukker, Audi came back to defeat previously unbeaten La Herradura, 10-9, Saturday in the Joe Barry Memorial Cup Tournament in front of a large crowd at rain-soaked Isla Carroll West Field. Audi’s Nic Roldan scored eight goals including the tying and winning goals to enable Audi to advance into Wednesday’s semifinals. “It was just a matter of more patience and trying to stay cool,” Roldan said. “We couldn’t have been playing any worse in the beginning. Nothing was going our way. “Slowly but surely we started clawing back,” Roldan said. “It’s a huge win, a great win for us. Roldan, ranked at eight goals, had six goals in the second half, four on penalty shots. Audi and La Herradura tied at 2-1 in win-loss bracket play. Audi’s head-to-head win over La Herradura clinched the No. 1 position. The other semifinalists will be determined in Sunday games. La Herradura, appearing in its final tournament at IPC this season, advances to Thursday’s Bobby Barry subsidiary semifinals. In other Saturday games, Coca-Cola defeated Orchard Hill, 14-13 in overtime and Crab Orchard routed Goose Creek, 12-6. After a less-than-stellar first half, Audi was a different team in the second half, chipping away at La Herradura’s 8-3 lead early in the fourth chukker and wearing them down with their aggressive style of play. La Herradura was one of only four remaining undefeated teams going into the much-anticipated contest. It was Audi’s biggest win of the tournament against two of the game’s legends, Memo and Carlos Gracida, both former 10-goalers. Audi did just that outscoring La Herradura in the final three chukkers, 2-1, 2-1 and 3-0. “It was not going to be anything easy today, everything had to be earned,” Ganzi said. “The field was slow, it was wet and they are legends. We had to beat two legends that come to the field very prepared with a good game plan and a ton of field intelligence. Marc Ganzi of Audi defends and bumps Carlos Gracida of La Herradura out of a scoring play. It was also the biggest game for Audi’s young sensation Carlitos Gracida, who played against his father Carlos and uncle Memo, for the first time in International Polo Club Palm Beach history. He scored two goals and came up with some key defensive plays in the second half. It was Carlitos’ play despite his father closely defending in the sixth chukker that helped turn Audi’s fortunes around. Carlos Gracida was also proud of his son’s performance. Led by Carlos Gracida’s six first-half goals, including four on penalty shots, and Memo Gracida, the field general controlling the ball, La Herradura took early control of the game. Nic Roldan of Audi with the nearside neck shot to keep the ball in play. “They came out with a bunch of powerful horses and played well,” Roldan said. “We came out a little slow and we got in the rhythm of their game and we were soft. At halftime we talked and knew we could get a lot closer if we played our game and were patient. There were a few anxious moments in the opening of the sixth chukker. 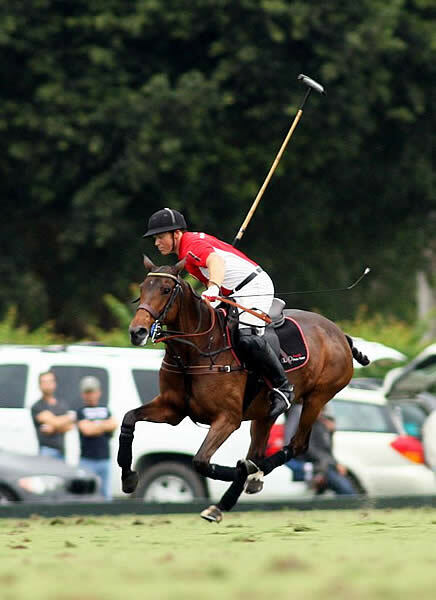 Audi’s Nico Pieres was riding hard chasing the ball when he toppled off his horse and rolled on his neck and right arm. He was examined by Audi trainer Jeremy Fedoruk and returned to the game. After a season-opening loss to Orchard Hill, Roldan and his Audi teammates have found the winning chemistry. 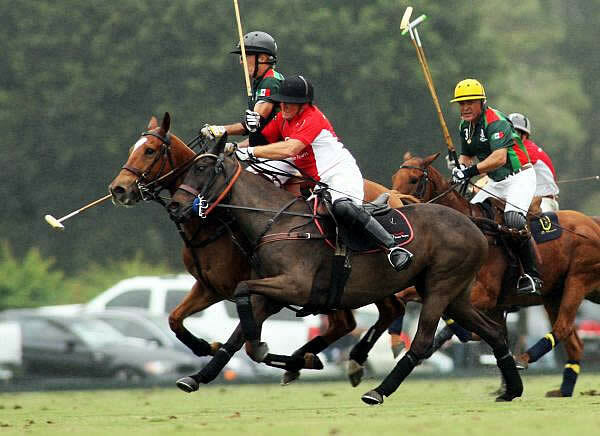 Grand Champions Polo Club’s other elite polo team, Piaget, will play Lucchese on Sunday morning at 10 a.m. at Jan Pamela South Field in the first of four games scheduled. Other Sunday games are Valiente vs. Zacara on Field 4 at 10 a.m.; Faraway vs. Lechuza Caracas on Field 3 at noon and ERG vs. Villa del Lago at 3 p.m. in the stadium game. January 20, Sunday: Piaget vs. Lucchese, 10 a.m.; January 23, Wednesday, 1 and 3 p.m., Joe Barry Cup Semifinals; January 24, Thursday, 1 and 3 p.m., Bobby Barry Cup Subsidiary Semifinals; January 27, Sunday: Bobby Barry Cup Final, noon; Joe Barry Cup Final, 3 p.m.